1. 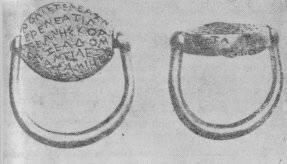 An inscription on a golden ring from the village of Ezero, P rvomaj district, dating to the V-th c. BC. 2. An inscription on a stone plate from the village of Kjolmen, Preslav district, probably dating to the VI-th c. BC. 3. 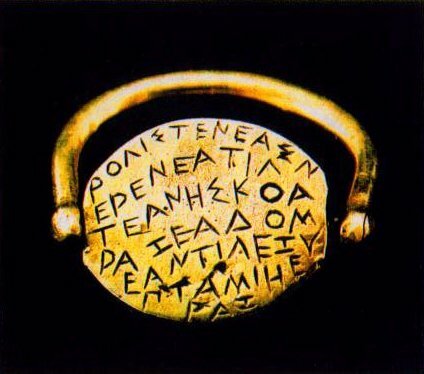 An inscription on a golden ring from the village of Duvanli, Plovdiv district, probably dating to the V-th c. BC. 4. An inscription, repeated four times on four silver vessels discovered in a mound near the same village of Duvanli, dating to the end of the V-th or the beginning of the IV-th c. BC. In the same neighbouhood besides the ring there were found other items belonging to a burial – a golden diadem, a small golden spoon, two triangular golden plates, a broken bronze vessel, a round bronze mirror and a broken bronze bracelet. It was obvious that the golden ring belonged to the burial of a noble Thracian. The reading of the letters poses no difficulties but division of the text into words is uncertain. Up to now there appeared more than 20 translations of this text [See D. Detschew, Die thrakischen Sprachreste, Wien, 1957, pp.567-582], none of them being commonly accepted. Here we list the interpretations of the Buglarians academicians D. Dechev and Vl. Georgiev. N ua(s?) sn letedn ued(n), ne in dakatr s! Translation: “Ebar (son) of Seza(s) I 58 years lived here. Do not damage this (grave?)! 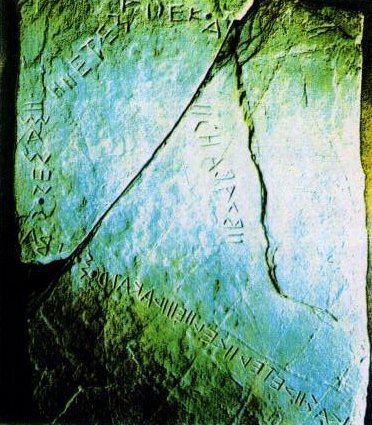 The Kjolmen inscription comes from south-eastern Moesia, at the northern boundary of Thracia according to Vl. Georgiev, and shows some (Daco)Moesian features. Thus Georgiev regards the language of the inscription as belonging to a transitional Thraco-Moesian dialect. Text: eys, ie … dele, mezenai. The image of the horseman clarifies the word mezena as meaning ‘a horseman’. 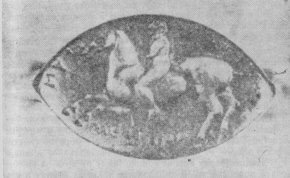 The Thracian mezena (mezenai in the text) is almost identical to the name (the epithet) of the Messapian deity of (Iuppiter) Menzana, the “horse deity” to which were sacrificed horses. It also corresponds to the Albanian mes, mezi (‘a stallion’) and the Romainan m nz (‘a stallion’). The latter is Dacian in origin from the IE *mend(i)- ‘a horse’. The Thracian mezena and the Messapian Menzana – from the IE *mendiana mean ‘a horseman’. In support of this reading he cites the correspodent translation of the above phrase into Albanian, which would sound as: Dhem del (zot) m . The Albanian language, as a successor of the Dacian language, was closely related to Thracian. Besides these four inscriptions, there are around twenty inscriptions on vases of fragments of vases from the island of Samothraci. They are, however, only partially preserved and very short.